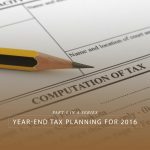 Now that the elections are over for this cycle, are there any additional year end tax planning techniques that taxpayers should consider? The answer depends on what you think the chances are that there will be changes to tax rates and/or the deductibility of certain currently deductible itemized deductions. The House Ways & Means committee earlier this year published a blueprint for the kinds of reform the House is considering. Key elements include a simplification of the seven existing tax rates that range from 10% to 39.6% down to three rates: a 12%, a 25% and a 33% rate for individuals. Taxpayers with income received from sole proprietorships (Schedule C income) or pass through entities (like partnerships, LLCs or S corporations) would see that income taxed at a maximum rate of 25%, harmonizing that tax rate with contemplated corporate tax reform the House is also considering. A set of separate tax rates on capital gains would be eliminated in favor of excluding 50% of long-term capital gains from the tax calculation (older taxpayers may remember this system as a decades-long capital gains tax mechanism that ended during the Reagan years). The House language would eliminate all itemized deductions for individuals other than the mortgage interest deduction and the deduction for charitable contributions. This gets rid of deductions for property taxes; state income and sales taxes; employee business expenses; medical expenses not covered by insurance; and miscellaneous expenses for things like investment advice. Although not spelled out, the white paper on tax reform indicates that Ways & Means will evaluate whether to make changes to the mortgage interest deduction like dropping the maximum mortgage amount on which interest is allowed from its current $1,000,000 cap. President-elect Trump’s tax plan is similar in philosophy to the House plan, but with some key differences in the details. Trump’s plan envisions three tax brackets for individuals: a 12%, a 25% or a 33% tax bracket, the same as the House plan. Trump’s plan would raise the standard deductions for itemized deductions to $15,000 for single taxpayers and $30,000 for married couples, a substantial increase in the standard deduction and one that would remove millions of lower income taxpayers from the tax rolls entirely. On the other end of the income spectrum, Trump’s plan would cap itemized deductions from all sources to $100,000 for single taxpayers and $200,000 for married couples. Trump’s plan eliminates the carried interest “loophole” used by Wall Street and hedge fund managers. At some point after the inauguration, the Trump administration and the House Ways & Means committee will start negotiating, so the details for either/both plans are fluid – it’s anyone’s guess what a final bill would look like. However, it’s reasonable to assume that there will be significant drops in marginal rates accompanied by material limitations or flat out eliminations of itemized deductions. The next thing to guess about it what the chances are that a significant tax reform bill will get passed in 2017. Since Republicans will hold a majority in both the House and the Senate (we’ll know in the next couple of weeks the exact count in the Senate when the Louisiana run-off election for their open seat is held), it’s reasonable to assume that there will be some tax reform bill brought to the floor. Ordinarily, the party in the minority would be able to filibuster a bill, but due to changes in the Senate rules during the years Harry Reid was the majority leader, bills related to the U.S. budget require only a bare majority and are essentially “filibuster proof”. Even given that change Congress has only passed one budget since 2009 (in 2015). The budget for FY2017 has been funded through continuing resolutions which will expire early next year and the FY2018 budget will need to be passed by the end of September 2017 to avoid a shut down – thus Congress will get two bites at the apple in 2017 to pass significant legislation without needing 60 votes in the Senate. Current thinking is that major tax legislation will likely be attached to one or both of those budget bills. We’re here, it’s now -what does it all mean to individuals? On the deduction side, there’s even more reason than usual to accelerate deductions. Check back on our earlier advice on how to maximize your mortgage interest deduction. 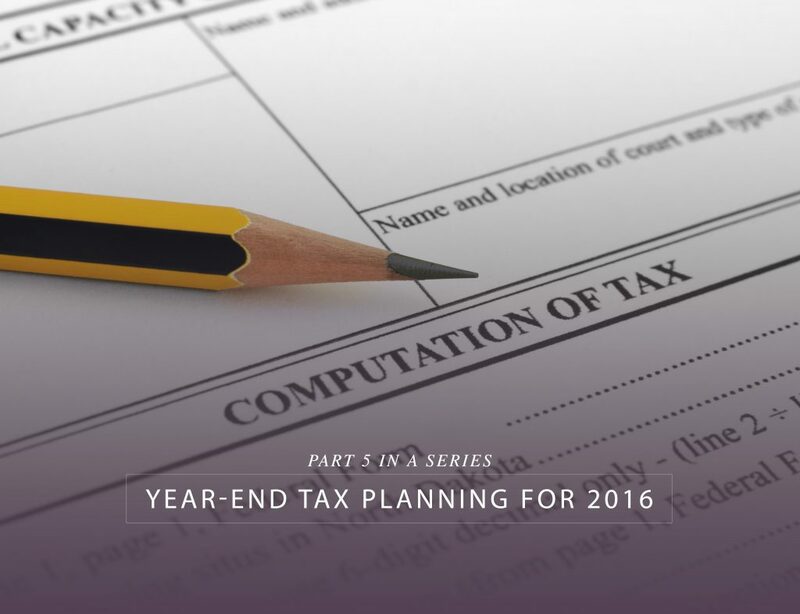 If your second half property tax bill is due in the first couple of months of 2017, consider paying it in 2016. Similarly with auto tabs due early in 2017 and any employee business expenses (assuming you are over the 2% limitation for miscellaneous itemized deductions – see our “bunching deductions” explanation). As always, let us know what questions you have.